Quentin Tarantino is back on the Oscar scene with his second Best Picture nomination in a row for Django Unchained. Christoph Waltz brings his sweet accent and acting brilliance to the screen once again, but this time as a good guy. 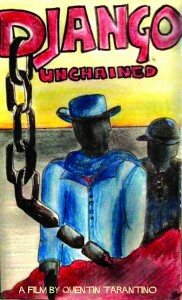 Waltz plays Dr. King Schultz who frees Django (Jamie Foxx) from slavery, promising to help him seek revenge on the man that keeps his wife as a slave. Schultz helps Django transition from chained-up slave to the powerful hero of the story. Leonardo DiCaprio plays the villainous Calvin Candie, plantation owner and overall horrible human being, and is absolutely incredible in this role. At the climax of the film Candie smacks his hand on a table in anger, shattering a glass and cutting his hand, and continues on with the scene without flinching. He is the definition of a character you hate, but whose performance is so amazing you have to love him. The soundtrack is all over the place, albeit, in a good way. The film is a hybrid of genres so it would only make sense for the soundtrack to be the same. Borrowing from rap, soul, folk and classic western soundtracks, Django’s music works perfectly with the film and is memorable to say the least. While certainly not one of Tarantino’s best films, Django Unchained is a refreshing revival to the Western genre while still offering us something new. With hilarious dark humour and typical Tarantino gore, Django certainly has earned its spot on the best picture list.